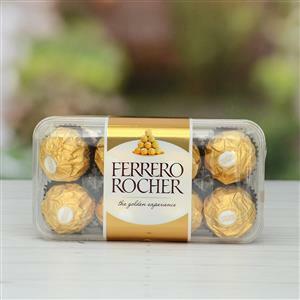 Send Ferrero Rocher - 16 Pcs (Express Delivery) to Chennai. Gifts to Chennai. Send Chocolates to Chennai. Description : Delight your dear ones in Chennai with these mMouth-watering 16 Pc chocolates in a crispy and crunchy hazelnut exterior individually wrapped for that freshness. The smooth and creamy soft milk chocolate piece is just breathtaking for the chocoholics! Thus, send these sinfully delectable chocolates to Chennai by availing express delivery service offred by Gift2Chennai.com. These Gifts to Chennai will be delivered to the recipient within 24 hours of placing your order.